Five classic cheeses representing some of the best from both sides of the Channel. To serve approximately 220 people. 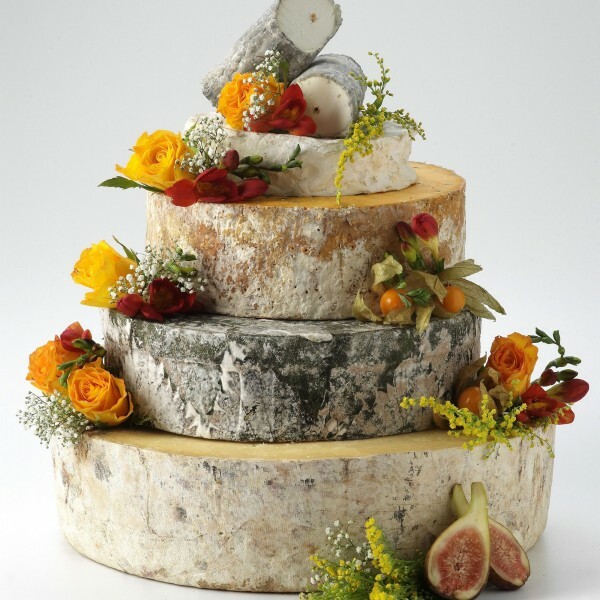 Combining the traditions of France and the innovations of England, a classic and colourful cheese wedding cake;. To serve approximately 220 people. Ideal as a centre piece at a wedding or indeed any large celebration. The diameter of the base cheese (Montgomery Cheddar) is approximately 32cm. Please note we require at least three weeks notice to supply this Cheese Cake. St Maure PDO min wt 250g x 6. A full flavoured goats cheese, which holds a rye straw bearing the name of its producer. Shropshire Blue min wt 3.5kg A smooth textured blue cheese with a rich, rounded flavour and distinctive blue veining through the russet interior. Cornish Yarg min wt 2.5kg. Deliciously fresh in flavour, creamy under the rind and crumbly at the core, this Cornish cheese is wrapped in nettles.